Our Onsite team believes in providing the best attention and works under the team leader guidance to maximize output. The Onsite team also specialize in re-engineering projects and try to minimize both cost and delivery time of the project. Projects that are repetitive benefits more from the Onsite delivery model. 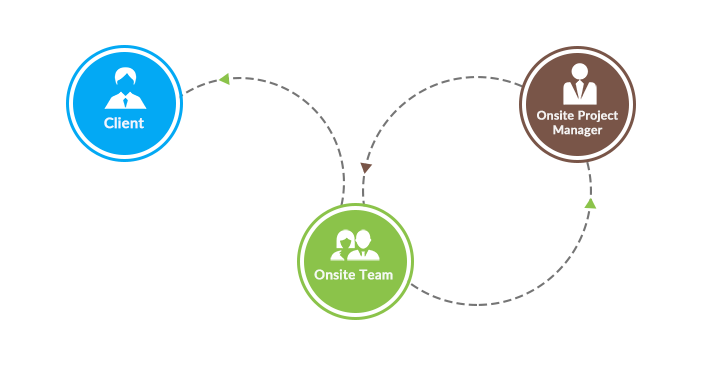 The path between our consultant and the onsite manager is always kept open so that our in-house team can always improve the onsite experience for both the client and the onsite team. There are tons of benefits using the On-Site delivery model because of the available personal experience and expertise to the whole process. The presence provides a lot of traction to the project idea and also provide real-time solutions with expertise at hand. Low market penetration time, excellent communications, late changes are just of the benefits that come with the On-Site delivery model.